1. Cancellation / No Show Charge: Cancellation of SEVEN (7) days prior to arrival date: 1 night charge. No Show: FULL amount of reservation. 2. Rooming List: Complete rooming list must be received at least SEVEN (7) days prior to arrival; failing which the Hotel reserves the right to release all rooms for the confirmed booking and levy above cancellation charges, and will not be liable for any claims that may arise. 3. Mode Of Arrival / Departure: In event of any delay in, postponement or cancellation of scheduled check-in / reservation at the Hostel arising directly or indirectly from the re-scheduling or cancellation of any form of transport to / from the Hostel whatsoever contracted for / by the Hostel guest, the Company / Hostel shall not be any way held responsible nor liable to the Tour Operation / Agency or its customers nor caused to suffer losses and shall nevertheless be entitled to apply and levy the above Cancellation / No Show charges. 1. Check –in & Check-out: Check in time is at 2:00PM and check-out time shall be before 11:00AM. Any request for early check-in or late check-out shall be subject to room availability and have additional charges may apply. What started out as a concept for a traveler’s space has now become the heartbeat of a neighborhood turned capital-of-cool. Locals and visitors have seen the best of Manila skyline up in our world-renowned roofdeck, have met travel-buddies-now-lifelong-friends inside our dorm rooms, and have experienced the brand of fun only Filipinos can bring out at any time. This is Z Hostel --- a new generation of travel accommodation that is transforming the hospitality industry: more interactive, more social, more human. 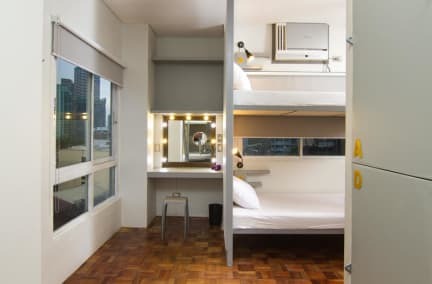 Z Hostel is a pioneering social hostel located at the heart of the Makati metropolis. The energy inside Z is infectious as social events and human interaction take centerstage. Carefully curated events are happening every night at the roofdeck and in the neighboring establishments promoting local arts, music, and culture. For Z, socialization is the new sleep. And while every traveler’s comfort is valued, Z is foremost a social venue. Nice place to stay in Manila. The best hostel ever! Nice environment, super clean, helpful staff!